Craig Iffland, a fifth-year Ph.D. candidate in the Department of Theology, has been named a 2017 recipient of the Charlotte W. Newcombe Doctoral Dissertation Fellowship from the Woodrow Wilson National Fellowship Foundation. “My research focuses on the ways in which religious beliefs can positively influence the development and protection of legal regimes protecting human rights,” says Iffland, a doctoral student affiliate in the Kellogg Institute for International Studies and a graduate student scholar in the Center for Theology, Science and Human Flourishing. “While the dissertation concerns a topic that is intrinsically theological, my project is interdisciplinary in scope, bringing theological perspectives on the divine law into conversation with contemporary philosophers of law about the nature of law and legal systems,” he explains. 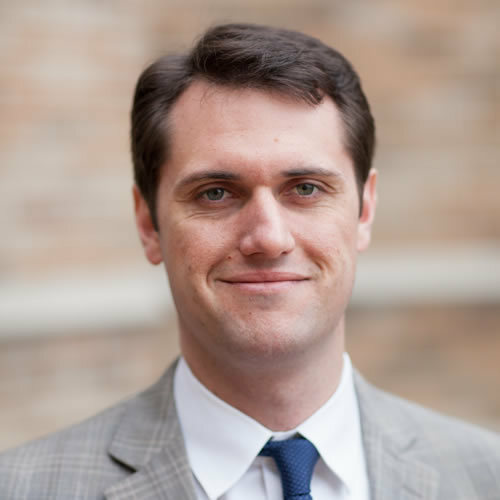 The direction of Iffland’s studies were influenced in his first year at Notre Dame by the opportunity to work as a research assistant for Kellogg Faculty Fellow Rev. Robert Pelton, CSC, as he was completing the production of his documentary, Monseñor: The Last Journey of Óscar Romero. “It was Romero’s impassioned appeal to the divine law in the face of tyranny that inspired me to think more deeply about the role of the divine law in the defense of human rights,” Iffland says. In 2015, he won a USAID Research and Innovation Fellowship to conduct research on “The Applicability of International Humanitarian Law in Contemporary Armed Conflict” in Johannesburg, South Africa. He is also the recipient of Kellogg conference travel grants that have permitted him to present portions of his dissertation in Santiago, Chile, and Rome, Italy. Funded by the Charlotte W. Newcombe Foundation, the Newcombe Fellowship was created in 1981 and has supported just over 1,200 doctoral candidates, most of them now noted faculty and thought leaders in their fields. The fellowships are designed to encourage original and significant study of ethical or religious values in all fields of the humanities and social sciences.